ECIR Group Inc. Announces Second Film Release | ECIR Group, Inc. Success starts with getting the right diagnosis. Not all fat horses have high insulin. For the sake of your horse, be aware of what works and why. A step toward better understanding. What Can You Tell By Just Looking At Hay? Knowing what to look for does yield information but testing is critical in key areas. How Long Can You Talk About Laminitis? Why a multi-day conference on Laminitis is so important. The 2017 NO Laminitis! Conference - Who Should Attend? Science and facts behind ideal healthy feeding. The story of the Great Pergolide Scare of 2007 and the horse owners who took on the FDA. 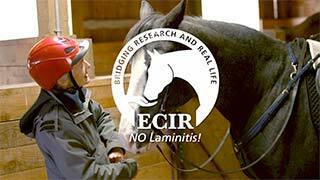 Announcement of educational film The ECIR Group: NO Laminitis! For downloading proceedings and recordings.